Good develops a suite of decidedly un-fun Android apps intended for enterprise users. There's a pretty good number of them out there too. The Play Store has apps for accessing intranet, managing contacts, and handling email. There's also Salesforce integration. 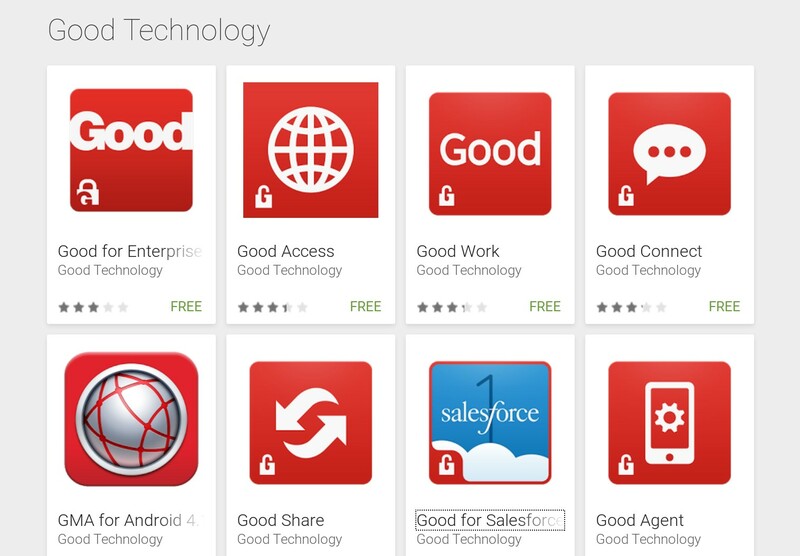 Over 6,000 organizations already use Good apps. This acquisition, which will cost BlackBerry $425 million, is a good fit for the company. As general consumers switched in droves to iPhones and Android devices, enterprise customers remained those most hesitant to let go of their old BlackBerry phones. The company has traditionally placed a greater emphasis on security than its competitors, and this purchase fits right in line with that thinking. Good for them. By the time the leaked BlackBerry Venice arrives later this year, it looks like it will be a good phone to use for work. Something good for employers and government managers to keep in mind. Good apps for that qwerty keyboard and such. Good, good. WATERLOO, ONTARIO and SUNNYVALE, CALIFORNIA--(Marketwired - Sept. 4, 2015) - BlackBerry Limited (NASDAQ:BBRY)(TSX:BB), a global leader in secure mobile communications, today announced that it has entered into a definitive agreement to acquire Good Technology for $425 million in cash. The acquisition of Good is aligned with BlackBerry's strategy to offer customers the most complete, end-to-end solution that secures the entire mobile enterprise, across all platforms. Enhanced by Good, BlackBerry will expand its ability to offer a unified, secure mobility platform with applications for any mobile device on any operating system – supported with security that has been certified by governments around the world embedded in every component of the mobility infrastructure. Good will bring complementary capabilities and technologies to BlackBerry, including secure applications and containerization that protects end user privacy. With Good, BlackBerry will expand its ability to offer cross-platform EMM solutions that are critical in a world with varying deployment models such as bring-your-own-device (BYOD); corporate owned, personally enabled (COPE); as well as environments with multiple user interfaces and operating systems. Good has expertise in multi-OS management with 64 percent of activations from iOS devices, followed by a broad Android and Windows customer base. (1) This experience combined with BlackBerry's strength in BlackBerry 10 and Android management – including Samsung KNOX-enabled devices – will provide customers with increased choice for securely deploying any leading operating system in their organization. The proven Good Dynamics platform provides app-level encryption, advanced data loss prevention and secure communication between applications. The platform has more than 2,000 independent software vendor and custom applications built today. "By acquiring Good, BlackBerry will better solve one of the biggest struggles for CIOs today, especially those in regulated industries: securely managing devices across any platform. By providing even stronger cross-platform capabilities our customers will not have to compromise on their choice of operating systems, deployment models or any level of privacy and security," said John Chen, BlackBerry Executive Chairman and CEO. "Like BlackBerry, Good has a very strong presence in enterprises and governments around the world and, with this transaction, BlackBerry will enhance its sales and distribution capabilities and further grow its enterprise software revenue stream." Good's technology will integrate with BlackBerry's enterprise portfolio and trusted global network, creating a comprehensive management solution for all mobile devices that protects customers' security and privacy. This holistic experience will provide customers with greater mobile enterprise productivity, including seamless integration of capabilities across multiple applications, including BBM, WatchDox, Good Work and other value added services. "Enterprise customers today demand stringent security and the most flexible platform across all mobility strategies," said Christy Wyatt, Good Chairman and CEO. "We are excited to join BlackBerry, where together we will be the most comprehensive mobile platform in the market. Good has worked hard to deliver the highest levels of security across operating systems and applications. Our trusted Good solutions will also help BlackBerry to accelerate its Internet of Things platform for managing endpoints beyond mobile devices." BlackBerry has provided the world's most secure mobility solutions for more than two decades, and has earned more than 70 government certifications and approvals, greater than any other mobile vendor. The BlackBerry 10 platform is the first mobility solution to receive the coveted Full Operational Capability (FOC) certification to run on U.S. Department of Defense networks. Good is the only company certified as Common Criteria Evaluation Assurance Level 4 Augmented (EAL4+) for mobile collaboration on both iOS and Android. This is the highest certification level recognized internationally under the Common Criteria program, and is globally regarded as the standard of quality for handling sensitive government data. BlackBerry expects the transaction to be completed toward the end of the company's 2016 fiscal third quarter and is subject to customary closing conditions, including regulatory approvals. The company anticipates the acquisition to be accretive to earnings and cash flow within the first year after closing. BlackBerry also expects to realize approximately $160 million in GAAP revenue from Good in the first year, including the impact of an expected write-down of certain deferred revenue of Good. J. P. Morgan Securities LLC and Bank of America Merrill Lynch served as financial advisors to Good Technology, and each provided a fairness opinion to the board of directors of Good Technology.